Toddlers have many wonderful qualities, but sharing isn’t one of them! They can have a whole basket full of toys, but the minute their siblings or friends pick just one of them to play with, everything can turn destructive very quickly. The truth is, toddlers just don’t understand the concept of sharing. They do however, fully understand the word “mine!”. It’s only through social and emotional development that the ability to share things with others starts to kick in. That isn’t to say that you can’t teach your little one how to share however. 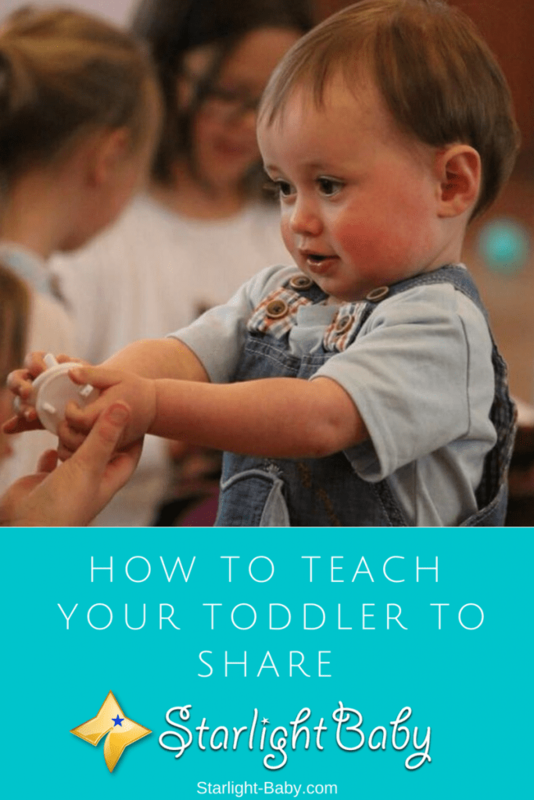 Here, you’ll discover some of the best ways to teach a toddler that sharing isn’t a bad thing. If you want to make it easier on yourself, it’s best to start teaching your child how to share the minute they can actually grasp an object. Take whatever it is they have grasped away and say something like “my turn”, then quickly pass it back and say “your turn”. Do this frequently enough and your little one will soon discover the basics of sharing. Now, if your toddler is past the grasping stage, you can still use this method. There just might be a few tantrums and tears initially. Persevere! They’ll soon learn they’re going to get their toys back. Similar to passing objects backwards and forwards, you can also take turns doing things with your toddler. So, say you’re reading them a book. They can read one page, while you read another. Or, you could be doing a puzzle together and you could put one piece in, then they can put another in. This method teaches them to share while doing an activity and will come in very useful when they are playing with their siblings or friends. Now, it’s worth pointing out, toddlers are often more willing to share some things than others. If they have a favorite toy that they rarely leave behind, it’s highly unlikely they’re going to be willing to share it. So, before playdates are due to pop around, it will be a lot easier to simply hide or put away their favorite toy; leaving behind only things they wouldn’t be too upset to share. Your toddler looks to you to determine how to act. So, if you are rarely seen sharing your possessions, they’re going to be reluctant to share theirs too. Be sure to let them see you sharing things such as your phone, or a magazine for example. You can also share certain things with your toddler. Then ask them to share things with you. An example of this could be you ask them “Do you want to share my book and I’ll share your bear”? Technically, it’s more of a swap, but it does teach them more about what sharing means. They also get to see that if they do share, they get something out of it too. One of the main worries toddlers have when it comes to sharing, is they won’t get whatever it is, back. They have no real concept of time at this age either, so saying they have to share for say, 10 minutes, won’t necessarily provide much comfort! Instead, you can use a timer which will go off once the time is up. It gives them something to either watch as it counts down, or to listen out for. Then, once it goes off it’s their turn to use the toys again. This will gradually teach them that they will get their possessions back and sharing will become less worrying for them in the future. It’s common for parents to praise their toddler for sharing, but did you know a simple “you’re such a good boy/girl” might not be enough? It’s a really vague statement and doesn’t really show them why sharing is good. What’s better, is to say something such as “did you see how happy Joseph was when you let him share your toy car?”. This can help with your little one’s emotional development as they learn that sharing makes others feel good, which in turn will make them feel good too. Logically, it seems like the best way to handle a toddler who refuses to share is by disciplining them. After all, that’s how they learn that they’ve done the wrong thing isn’t it? However, in terms of sharing, if you do scold them for refusing to share, it’s actually going to make your toddler associate sharing with resentment. This will lead to further battles every time they’re expected to share. Your toddler is more likely to share their things if it’s their decision. If you simply take whatever it is by force, they’ll start to want to cling onto their possessions even more. It may sound silly, but it is important to make sure you are respecting your little one’s things. Likewise, be sure to teach siblings and other caregivers to respect your toddler’s belongings. There’s going to be times when nothing seems to work and your toddler is adamant they’re not sharing anything. In this instance, you can use the very clever distraction technique. Toddlers may be stubborn, but they’re also easily distracted. So, if you notice your little one is heading towards a full-blown tantrum whilst playing with a friend, distract them with something else. It could be food, or asking them to help you do something. Or you could consider plain old bribery. Yes, it doesn’t help teach them to share, but it will save your sanity for at least 10 minutes! Overall, what you need to remember is toddlers are still young. They aren’t always going to be willing to share their possessions and they simply don’t have the capacity to understand why it’s so important. Sharing is a skill that develops as they get older. So, if you are struggling, just remember it’s a phase your little one is going through and it will pass. Got your own tips on how you got your little one to share? We’d love to hear them in the comments below! Hi, I am an ECE teacher and I do like all this information especially to a first time mothers everywhere. But I truly appreciate how outdoor really helps a bored toddler. It is true in all children, that outdoor is so much because it helps them use all there motor skills. So it is a good way to teach new mothers that this are the ways to help toddler explore and enjoy the nature. I usually do nature walk and my toddler enjoy that mostly because she can really enjoy walking, running and exploring different things that she sees. I had to smile when reading this. I think I have done a pretty good job with teaching my daughter to share because of what I’m going to say here. 🙂 We’d had play group at our house. Kids came, played great together, and all was well. Aw, that’s adorable but I suppose being overgenerous is a good problem to have right? I remember when I was about five my mother told me she was going to get pizza. I decided to invite everyone in the neighborhood over for pizza. 20 minutes later there were 15-20 kids outside our house… and my mother only had one pizza. My parents both still joke about it, and everytime something happens like you just shared my parents point it out. That backpack checkpoint is a good idea, you never know what could sneak its way out! Thank god we didn’t have to face any problems with sharing. I don’t know why but my little one is just such a giver. He actually LOVES to share his toys. I was pleasantly surprised whenever I watched him play with other children. He didn’t mind if they played with his toys. But this article reminds me of one girl from his pre-kindergarten group. I won’t say the girl’s name but she sure did have some issues with sharing, haha. What happened was, that she had a big soft toy that she brought with her. During the day, she left it on the floor next to a wall and one of the other girls in the group saw it, picked it up and started to play it. When the girl saw that her toy is being used by somebody else she had such a tantrum. It was unbelievable. She started crying and screaming that it’s her toy and so on. I know all of this because it got told to the parents and then it was widely discussed for a month! So, be careful and use the tips described above. One can also play games. I had one where sweets were strewn on the floor and they had to run and collect as many as they could. They were then asked to share them with those who did not get any. They were happy to do that as they were being watched and applauded for their action. That’s true, iamawriter. Children mimic what adults do so we should be very careful with our actions. This article reminds me of a short video I’ve recently watched about a poor student who brought a lunchbox to school, but it doesn’t really contain anything. He went out of the classroom during break time to drink water for his “snack”. When he got back to his seat and was about to put his lunchbox away, he noticed that it felt heavy and when he opened it, it contained snacks that were given by his generous classmates while he was out. So awesome! When my nephew and niece were toddlers, I loved giving them chocolates, cookies, ice creams, juice etc. I also gave them toys, but I preferred to give them edibles instead of toys. Whenever I gave them edible items, I always took a bite and sipped before handing them. I would unwrap a chocolate, took a bite of the chocolate and give them. When they were eating, I asked them to let me have another bite. I did this on purpose. Now my nephew and niece love sharing.